Hi everyone! My name is Hirsh Sisodia, and it is my great honor to get to write directly to you all for the first time. Massachusetts has been one of the most hardworking and engaged states in the Eastern Region for many years now, and it’s been a privilege to getting to work with so many of you this year so far. 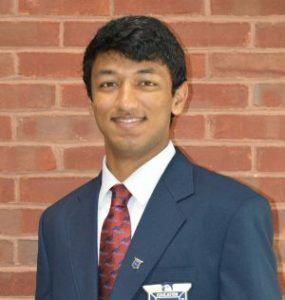 I am your current FBLA Eastern Region Vice President, and I have the honor of representing states such as Massachusetts, New York, New Jersey, and my home state of Pennsylvania, as well as territories such as Puerto Rico and the Virgin Islands, and nations such as China and Haiti, on the National Officer Team. Like many of you, FBLA has had nothing less than a huge impact on my high school career, as a student and an individual – and I’ve had a great time working with Massachusetts FBLA this year. In my opinion, this year brought a lot more than just a set of new local, state, and national officers. It brought new, bold, and admittedly sometimes overly ambitious ideas. I can personally attest to that statement, at the very least coming from the National Officer Team, but with no shame or timidity. While we are very dedicated to, and focused on, strengthening the current programs and events that have made our organization as robust and effective as it is today, we also have recognized the value in setting goals that may at first seem out of reach. Speaking with many of Massachusetts FBLA's very own members and delegates at the National Leadership Conference, I heard this very sentiment repeated over and over again - a desire for change and improvement and growth, rather than remaining stagnant or complacent. With that in mind, the national officers set an ambitious plan of work for our organization as a whole – something that the Eastern Region has helped lead the way in this year, as we always have at the local, state, and national level. Staying consistent with our long-standing partnership, FBLA has once again been wholeheartedly supporting the March of Dimes and their work to improve the health of mothers and babies, setting our goal at $500,000 to be raised nationally by our NLC in Atlanta this June. We had another year of very successful NFLCs in October – this year occurring in Baltimore, Charleston, and Omaha – where I had the chance to meet many members from Massachusetts and across the Eastern Region. This year brought an even stronger emphasis on communication with states, as the Tomorrow Business Leader was joined by bimonthly updates written by Regional Vice Presidents to inform members across the nation of the latest programs and events occurring within our organization. And we are excited to announce that the national officers will be continuing the innovative program created by last year’s FBLA National President Sam Kessler, and hold the second annual Launchpad event at the 2016 NLC in Atlanta. What excited us even more about this year back in July of 2015 was the potential for new programs and opportunities – ideas that could truly shape what our organization is and what it can be in the coming years, for its members and future members. At the forefront of these plans, however, were ideas for now, which included shifting a great deal of attention to the national prominence and importance of internships and job shadows, increasing FBLA’s mobile presence through a stronger emphasis on tech accessibility of FBLA resources, and devoting much more time than years past to developing and maintaining strong international support and growth. In addition, taking cues from many of the online educational resources that have exploded in the past few years, the national officers are taking a very hard look into how FBLA could capitalize on this trend – and perhaps design educational resources of our own in the very near future. Many of these ideas, being so recently shaped and developed, are taking a great deal of effort and considerable time to put into effect – but we are also very aware of the fact that organizations such as FBLA are defined by the way they embrace the future, and we are very hopeful about our organization’s ability to do just that. The main reason we are so confident, truly, is because of state chapters like Massachusetts, and the dedicated and energetic members that build those kind of state organizations. Members make FBLA – FBLA is genuinely nothing without them, and therefore the only way our organization can succeed is through the continued passion of all of these members, from the state officer to the local member. I am deeply hoping, and I know, that Massachusetts FBLA will take a leading role not only in state and national programs, but in our organization-defining passion for business and business education, as it always has. Whether it is raising funds for March of Dimes, competing in a competitive event, or simply donating community service hours for your local chapter, I cannot be more excited to join MA FBLA in leading the Eastern Region in doing the very same in 2016. Wishing everyone a great start to their year.